Explosive, dynamic and pure, Loren Kate’s beautifully crafted melodies are performed with an honesty and passion that is both humbling and inspiring. With a voice like spine-tingling velvet enshrouding a precious stone, paired with her down to earth humour and storytelling, Loren has created a sublimely haunting sound that is rapidly capturing the attention of audiences around the country. Her debut album, Brand New Shoes, is a great milestone for the 24-year-old songwriter. Recorded in an astonishing 5 days at Soundmine Studio in WA with producer Lee Buddle and 7 talented West Australian musicians, the album has the sound and feel of a highly crafted musical achievement, most likely due to the amount of energy, love and work done in the lead up to recording. 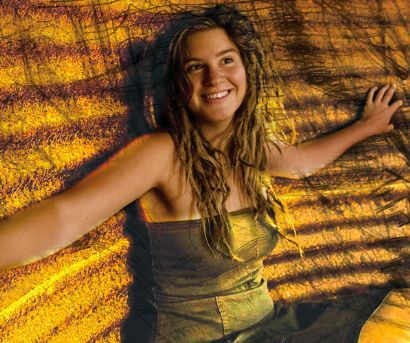 Having been on the road for the good part of 4 years, travelling and touring her music to most corners of Australia, Loren steadily penned the songs of the album along her journey in places such as Fremantle, Broome, Darwin, Adelaide and Byron Bay. The result is a beautifully dynamic, emotionally charged storybook of two or more years’ worth of joy, love, loss, gratitude, family, friends, travel and everything in between. Opening with the infectiously uplifting track Bird on My Shoulder, Loren weaves a light-hearted thread through the core of the album, with the message, ‘all these things are not as big as they seem’ and a whistling solo that won’t escape your head anytime soon.The title track, Brand New Shoes with its driving back-beat and exceedingly groovy harmonies (which include the voice of Perth singer-songwriter Freya Hanly) is another song reinforcing the positive vibe, which makes it the perfect precursor to the haunting and beautiful Ode to John, a song Loren wrote about her father, to whom the album is dedicated. Family is a theme that runs through a handful of Loren’s songs, and the epic Sticks and Stones tells the powerful story of her brother and a past addiction. With some impressive vocal textures and a string arrangement by Lara Norman, the song leads the album into a dramatic climax, which is bound to send shivers down even the most rigid spine. Soon after this relatively sombre moment, though, comes The Whale Song, which features Damian Smith on ukulele. Possibly one of the catchiest tracks on the album, the song keeps things progressing with an airy, ramblin’ folk feel and a light, but somewhat anthemic chorus. The album goes out on a similar note with the last track, Sing, being a simple yet moving declaration of gratitude to music and life in general, sending it all home with a colourful sea of a-Capella vocals and the inevitable smile on the face of whoever is listening to it. Winner of the emerging artist award for 2008, Loren Kate truly is a rising star. The best new talent i've seen in ages. ...Loren Kate, a star of the future.